Between the eighth and eleventh centuries, the Vikings surged from their Scandinavian homeland to trade and raid along the coasts of Europe. Their influence extended from Newfoundland to Baghdad, their battles were as far-flung as Africa and the Arctic. But were they great seafarers or desperate outcasts, noble heathens or oafish pirates, the last pagans or the first of the modern Europeans? This concise study puts medieval chronicles, Norse sagas and Muslim accounts alongside more recent research into ritual magic, genetic profiling and climatology. It includes biographical sketches of some of the most famous Vikings, from Erik Bloodaxe to Saint Olaf, from King Canute to Leif the Lucky. 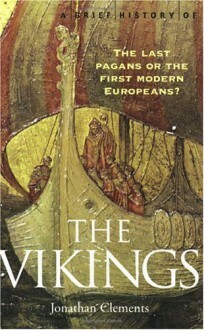 Extending beyond the traditional ‘Viking age' of most books, A Brief History of the Vikings also places sudden Scandinavian population movements in a wider historical context. It presents a balanced appraisal of these infamous sea kings, explaining both their swift expansion and its supposed halt. Supposed because the Vikings never really went away. Instead, posits Clements, they became a part of who we are today.